PPOD is a program from the National Diabetes Education Program at the Centers for Disease Control and Prevention (CDC), designed to engage providers from each of these disciplines so they can work together in actively identifying and treating patients with diabetes in a team-based care approach. By using this approach, providers can significantly reduce patients' risk of developing complications associated with diabetes like blindness, lower-extremely ulcers and amputation, gum disease, tooth loss, heart disease, and adverse reactions from drug interactions or poor drug therapy management. Providers of Pharmacy, Podiatry, Optometry and Denistry (PPOD) are well positioned to advise and educate patients about diabetes control and prevention. The PPOD Toolkit shows PPOD practitioners how they can work collaboratively with each other, as well as with other members of the health care team, such as primary health care providers, physician assistants, nurse educators and community health workers, to promote better outcomes in people with diabetes. In 2016 there were more than 552,000 Alabamians living with diabetes, more than 14% of the population, and thousands more have pre-diabetes. Compounding the issue of high rate of diabetes in the state is that in counties where diabetes prevalence is the highest, we also find high rates of poverty, and fewer providers per capita, leaving residents with the choice to drive a long distance to see a provider or not seek treatment at all. The map below illustrates the poverty rates in each county and also indicates the counties in the top 50% for vision loss and diabetes. 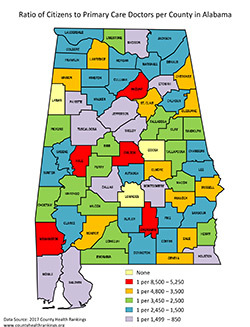 There is a high concentration of counties with high poverty and high rates of vision loss and diabetes along the eastern side of the state and in the south central part of the state. 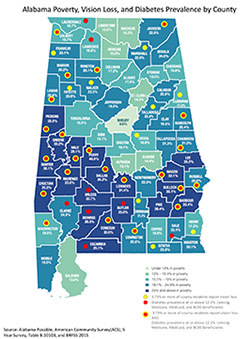 This map illustrates the ratio of Alabama citizens to primary care providers in each county. Counties with higher concentrations of residents also typically have higher numbers of providers, while more rural counties tend to have lower numbers of providers. 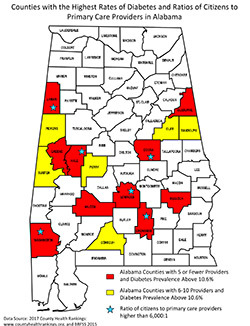 The following map combines the information from the two maps above highlighting the counties in the state with the highest rates of diabetes and ratios of patients to primary care physicians. Directing their patients to other health care professionals for treatment of conditions they do not typically treat. The following videos are PPOD providers' perspectives from the providers themselves, offerring insight into what each look for when treating patients with diabetes. For more information, please contact Betsy Cagle at betsy.cagle@adph.state.al.us.